Once upon a time when I was young in a land far, far away (America), I worked part-time in a beautiful clothing store called Lillie Rubin, which sadly is no longer around. Lillie Rubin was all marble floors and chandeliers, and full of glamorous cocktail dresses, evening gowns, and a few suits, all heavily embellished with sequins, paillettes, rhinestones, and beads. There were even glittering, slithery, glass-bugle-beaded gowns by Bob Mackie, perfect for the pageant girls… or for Cher, Mackie’s muse. Every few weeks when we got a new shipment of clothes at the store, my (amazing, still a dear friend) boss, Lee Ann, and I would rip off the plastic, put the clothes on proper hangers, and decide which things were our absolute favourites, and which of our clients we’d like to style in the various dresses. I would always immediately fall crazy in love with some things, and would really dislike others. Working in the store meant I had to look at all of them, the fabulous, the meh, and the awful, all day long. The insane part is, the clothes that I fell in love with the moment they arrived, I was usually bored with after a few weeks. The ones that I didn’t like at all? Well, they’d start to grow on me, and eventually I’d decide they really weren’t so bad, and probably had to have them. Sometimes all it took was one glamorous client putting on an outfit I previously hated to make me love it. First up, a blast from the past, a Versace ad from the age of the real Supermodels. It is one of my favourite ads of all time, despite the fact that I didn’t dress like this in the 80’s and still couldn’t now. This photo is to simply disavow you of any notion that socks and heels are frumpy. Here’s another Versace ad from the same time period. I mean, wow. 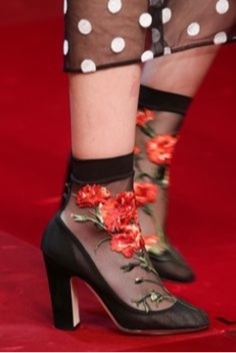 Last but not least, we have Dolce and Gabbana putting their Sicilian spin on the sock and heel combination for Spring Summer 2015; this is much easier to pull off. I can fully appreciate all of these looks, but I really can’t see myself making them work with my own Style. I’m just not quite that quirky, although the trend has completely grown on me. 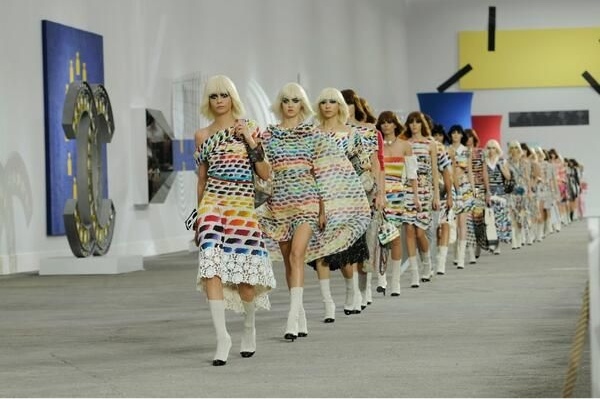 However, the game changer for me was the Chanel ad below. When I saw it, I knew that heels with a side of socks had to be in my life; it was simply a matter of time. Upon first seeing the ad, I photographed it on my phone, sent it to my most Fashion-obsessed friend, Cate, who replied with the text “We have lost you to Fashion” (which is rich, coming from her). Maybe so, but for me, this was the pivotal moment that socks and heels became a Style necessity. Once I graduate from the easy, wearable, almost boot-like effect of the Chanel look above (my gateway drug to the world of socks and heels), I might have to go nuts and try the sparkly, sequiny, Miu Miu sandal version below. THEN I will truly be lost to Fashion! Anyone care to join me in Socks and Heels territory? What fun! As a short woman, even I rocked a certain look in the 1980s: Checkered tights worn with striped ankle socks in the same black-on-red. I wore them with back patent “Minnie Mouse” shoes and a black wool skirt and plain sweater. It had a certain Vivienne Westwood-like verve! I’d do it today with some tougher shoes, I think. This will definitely be my favourite trend of this year. I love the idea of dressing out of the norm, it adds perspective! Yeah, I’m not cool enough to carry this off. Not to mention I don’t have the legs.